Boil the potatoes with their skins on and some salt. Peel once cooked and mash them. Let them cool down. Add 2 teaspoons of salt, the lime juice and the aji amarillo and mix well, gradually adding the oil to keep the mixture smooth. In a bowl, mix the tuna fish with the onions and mayonnaise. Add some salt and black pepper. 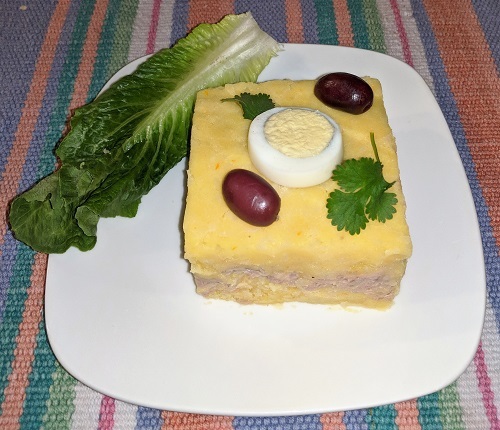 In order to assemble this dish you need to have a layer of the tuna filling in between two layers of potatoes and decorate it with slices of hard boiled eggs, olives, parsley and lettuce. You can assemble individual plates by using cookie cutters or you can prepare a big one from where to cut individual slices by using a tray or the outer ring of a springform pan. Alternatively you can put a layer of potatoes and a layer of the tuna filling on a plastic wrap and carefully roll it, as a jelly roll. Refrigerate for 1 1/2 hours before serving. Shredded chicken, crab meat or shrimp can be used instead of tuna fish for the filling. Avocados and tomatoes can also be used for decoration or even for an extra layer of filling.